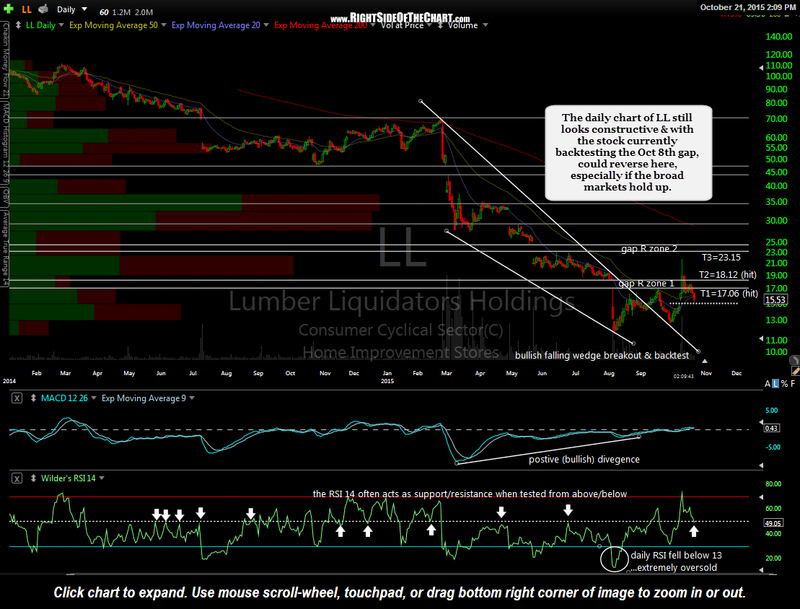 The daily chart of LL (Lumber Liquidators Holdings) still looks constructive & with the stock currently backtesting the Oct 8th gap, the stock could reverse here, especially if the broad markets hold up. As suggested in the original long entry on October 8th, the maximum suggested stop for those targeting T3 remains any close below 13.95. However, that suggested stop was calculated on the original entry price and would not factor in any additions to the position at higher levels. A more aggressive stop at this point could be placed either slightly below the bottom of the Oct 8th gap (14.68) or below 14.30 (just below horizontal support at 14.40).